With the changing of the clocks and the colder weather on its way out, many of us are turning our attentions to our gardens, patios and outside decks, taking advantage of the longer days. There’s nothing better than spending a long, lazy summer’s day outside, enjoying a barbeque with friends or unwinding by yourself with a good book. However, protecting yourself from the elements is often an important consideration in the UK summertime, whether keeping the sun off to avoid burning or sheltering from those inevitable showers. As mentioned above, perhaps the main advantage of installing a patio awning or canopy is the protection they give you from the changeable weather conditions we’ve all become used to in the UK. Providing shelter from the rain, patio awnings and canopies allow that barbeque to continue unimpeded, keeping everyone dry and stopping the rain from falling on any electrical equipment. Similarly, those who need a bit of relief from the beating sun will welcome the shade, preventing sunburn and sunstroke. 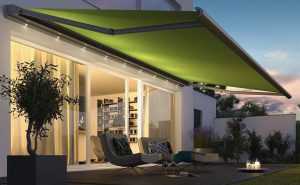 It may not be immediately apparent, but having awnings and canopies fitted can also save you money. Keeping direct sunlight off the exterior walls of your home reduces the need for air conditioning inside, while anything that diverts rainwater away from the brickwork is a bonus. With a wide selection of styles and designs available, awnings and canopies certainly add aesthetic appeal to the outside of your home, offering kerb appeal and a sophisticated finish to the property. Shading the inside of your home from direct sunlight also helps to stop carpets and soft furnishings from fading, prolonging their life span, while patio brickwork or decking is covered to prevent corrosion. Awnings and canopies can be installed relatively quickly by professional blinds experts, allowing you to enjoy your garden in no time. Using them is a simple process, with many designs winding in and out at the turn of a winch. Automated options are also available, making operation even easier, with opening and closing made possible via remote control. Patio covers can also be made from steel or aluminium, providing a robust and long-lasting option. Despite not having sides, standalone awnings and canopies effectively create a new room from your patio area, extending your living space into the garden. Those that work from home can take advantage by moving the office outdoors when the sun’s out, while extra storage for bikes or gardening equipment (provided they are secured) becomes available. As one of the leading providers of awnings and canopies in the North West, with either manual or electrical control options, the range at Gemini Blinds has something for everyone. From temporary ways to shade yourself from the sun to more permanent patio roofs, our team are on hand to provide advice and assistance through free home visits to determine your needs. Get in touch with Gemini Blinds today for more information.